Many of us will be traveling over the holiday season and traveling can put a kink in your usual skincare routine. Add in the stress of family gatherings and time on the road, and you may want to throw your hands in the air and abandon skincare altogether—only to regret that when January rolls around and you see the effects. We’ve got some great tips to help keep your skin happy no matter how hectic your holiday schedule is. With more social gatherings, holiday parties and seeing people you haven’t seen all year, you’ll probably be wearing more makeup more frequently than usual. And that can do a number on your skin. If there’s one product you shouldn’t put down for the month, it’s a great cleanser. 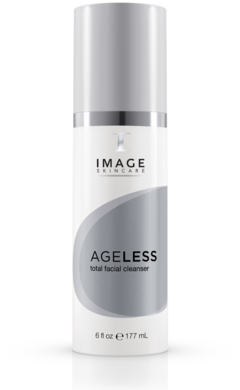 Our AGELESS total facial cleanser is a perfect choice. Its 3 in 1 action frees your skin from harsh makeup, balances the pH of your skin and gently exfoliates. You’re going to have to wash your face anyway—why not turn washing your face into a little mini-spa trip while you’re at it? You might not have time to do your whole skincare regimen when you’re staying at Aunt Gertrude’s house, but that doesn’t mean you can’t give your skin some TLC. Once you’ve cleansed your skin before bed, apply a quality moisturizing crème for overnight skincare. It only takes you a second, but a great moisturizer will work all night long while you catch some much needed Zzzs. 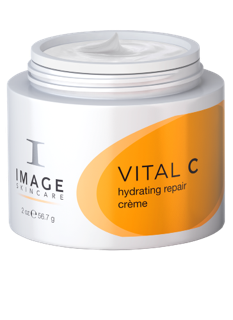 We recommend our VITAL C hydrating repair crème. While you’re dreaming of sugar plum fairies, our healing, hydrating vitamin C, antioxidants and skin-friendly emollient formula will be refreshing and rejuvenating your skin. The shelf where you store your skincare products at home may be overflowing, but the carry-on luggage your boyfriend allowed for your holiday break ski trip is woefully small. That doesn’t mean, however, that your skin has to take a hit. Streamline your skincare collection for on-the-go efficiency by choosing products that have more than one function. If you’re hitting the slopes (or even just going sledding with the kids), you need to protect your skin from harmful UV rays. Yes, it doesn’t seem fair that the sun can do damage during the winter, but it doesn’t take the holidays off. Our PREVENTION+ daily ultimate protection moisturizer SPF 50 is the perfect way to pamper your skin with an intensely moisturizing yet ultra-sheer and light formula while protecting it. It even contains plant stem cells to revive and refresh your skin. It’s time to celebrate the holidays—why let your skin suffer when you don’t have to? A little bit of prep and planning means that you’ll be able to weather the seasonal social scene and come out of it glowing.